Kathryn Lively reviews books about popular music and rock musicians. Find reviews of rock star memoirs, biographies, and histories of the rock and roll era. There is a scene in a made for TV movie about John Lennon where the former Beatle is listening to the radio while lounging near the beach. He pauses on hearing a curious harmony punctuated by a high-pitched ululation that sends him to the nearest phone to call his wife, Yoko. "They're doing your act," he enthuses with apparent belief that his beloved's avant-garde approach to music is finally gaining acceptance. On this revelation, the scene cuts to a studio somewhere in New York City, where the Lennons commence an historic return to public life through the production of new material that will eventually comprise Double Fantasy and Milk and Honey. To look at those brief moments in a film that otherwise presents a relationship faced with various challenges, one might guess John had been at his happiest and most enthusiastic in that time. I wouldn't doubt it. When Lennon and Ono entered the Hit Factory with The B-52's hit "Rock Lobster" no doubt ringing in their memories, they sought to put their own mark on the new decade. 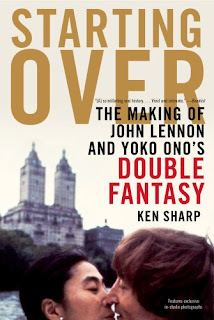 Ken Sharp's Starting Over attempts to record every detail of the making of Lennon's new music, and relies upon the memories of everybody involved in the production - from Yoko to producer Jack Douglas, guest artists Bun E. Carlos and Rick Nielsen of Cheap Trick, and a host of studio musicians and personnel, engineers, and music critics. Lennon himself is represented through interviews granted to various sources before his death. The structure of Starting Over offers the play-by-play through a series of direct narratives from all involved parties. If you have read Live From New York, a history of Saturday Night Live as told by cast and crew, you will be familiar with the format. Here, readers bounce around a series of "he saids" and "she saids" where everything from Lennon's day to day mood and work ethic to the food delivered for lunch (sushi mainly, until the band rebelled and began to sneak in hamburgers) is revealed. Largely visible, too, is the overall perception of Lennon being somewhat insecure in his work despite the absence of pressure from labels. Because Lennon was not under contract to make the record, he opted for strict secrecy (it almost worked) and seemed ready to destroy everything if it didn't turn out to his satisfaction. One can only wonder the fate of the music that comprised Milk and Honey had he not died - would he have approved of that release? Despite entering the relaxed atmosphere of the Hit Factory, a cloud did loom overhead - namely the pressure to live up to the Lennon name and reputation, as well as execute an impressive leap from the shadow cast by former band mate Paul McCartney, whose own 1980 album had gone gold. Some may view Lennon's decision to eventually sign with fledging label Geffen Records as opposed to McCartney's label (which, among others, courted Lennon) as a final act of non-conformity. Few stories in the book, told from different angles, contradict one another. Yet, when it happens it happens big. The process of arranging tunes in playing order, as recalled by Yoko, might have resulted in a disadvantageous placement of her songs if others had gotten their way. What I found most fascinating about Starting Over is the latter half of the story, the critical and public reaction to the finished Double Fantasy. As I read, I queued up the album to familiarize myself again with the music that seemed to dominate much of 1981 by virtue of our global mourning. Tracking responses by the major critics of the day, Yoko's work is singled out as the more innovative contribution to the album - interesting to note given that the bulk of Starting Over covers Lennon's involvement in the production. Lennon's songs, which mainly reflect his familial contentment and optimism, are dissected with great care, while explanation of Yoko's inspiration to write is hardly examined. I can only guess this lack of balance is attributed to Sharp's intention to offer Starting Over as a Lennon tribute, with the assumption that Yoko's story will be told in due time. This is not to say, however, that Yoko is shut out completely. We are reminded throughout Starting Over that two artists appear on the cover, and the story of how David Geffen finally won the most anticipated album of the new decade solidifies Yoko's importance in the project. For readers interested in Lennon's later history with a concentration on work rather than gossip, Starting Over is a nice "oral" history, but may come off as a bittersweet read given how the story ends. Thirty years after the events, the stories remain as fresh as the music. Kathryn Lively is a mystery author whose titles include Rock Deadly and Rock Til You Drop. Like the Reviews? Leave a Tip! I hope to end the Books That Rock hiatus and resume reviews in 2019. Until then, if you like what you've read so far, tips are appreciated. This is a review blog of books with a popular music theme - fiction, biographies, theory. Unless otherwise noted, all books have either been purchased or obtained from the library. All reviews written by Kathryn Lively are copyrighted by Kathryn Lively.